You might think that after writing the articles about Steven Lundberg and Orient and Flume that I would consider the last of the top three American Art Glass Studios, Charles Lotton in Crete Illinois. 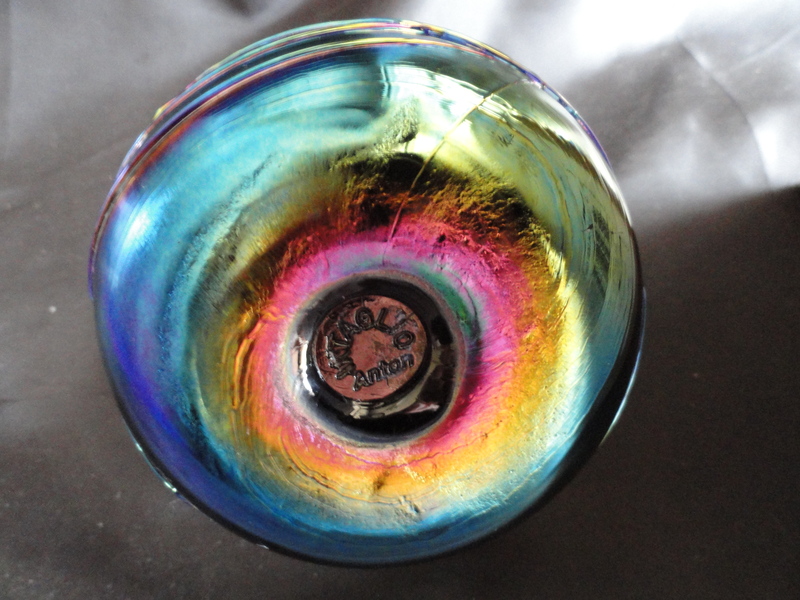 Although Lotton glass is very collectible, the studio I have chosen to write about is quite unfamiliar to most, even to the collectors who specialize in paperweights from the 1970 – 1990 time period. 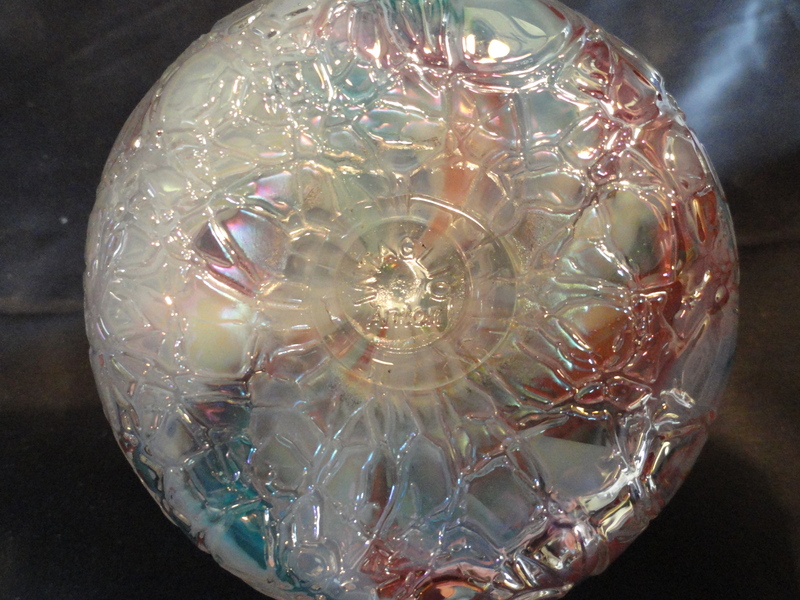 Many paperweight collectors are not familiar with the Intaglio Levay Glass Studio that was once located in a defunct schoolhouse in Alton, Illinois, only a few hundred miles from Charles Lotton. There is a wealth of information about this studio, some factual and some very “bizarre” as many from the midwest would say. It is a story filled with some mystery and innuendo collected second hand by me. Much of this information has been digested by me and regurgitated with my own spin or take on the events. That is to say that the conclusions are my own. 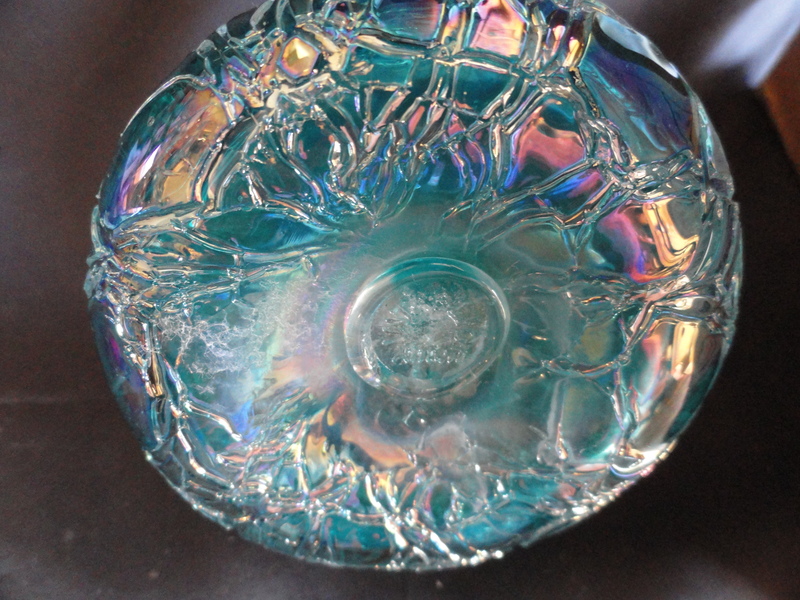 Intaglio Glass Studios (and a few other names) was the brainchild of Gary Levi. 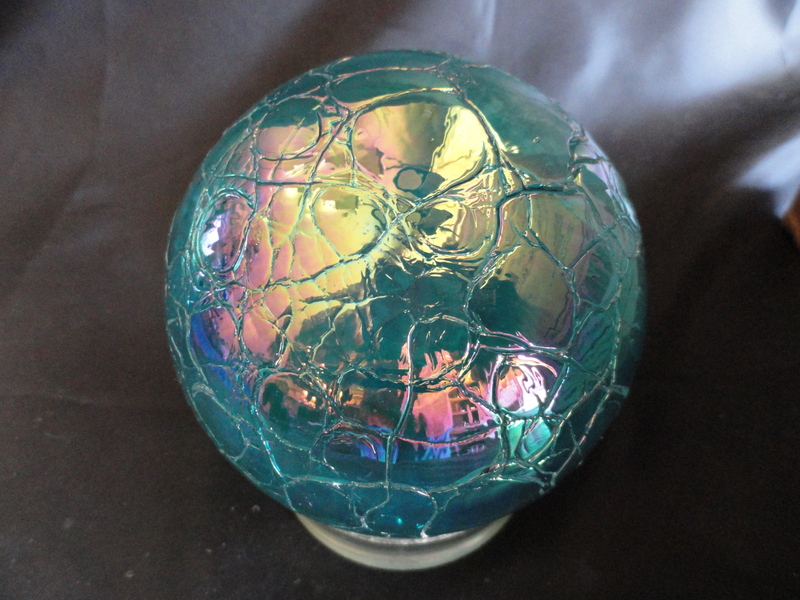 His history is both interesting and controversial depending on who you talk to but not in question is the exquisite “cypriote”, Tiffany style, iridescent paperweights that he marketed. The most interesting features of the work are the shapes and colors of the creations. 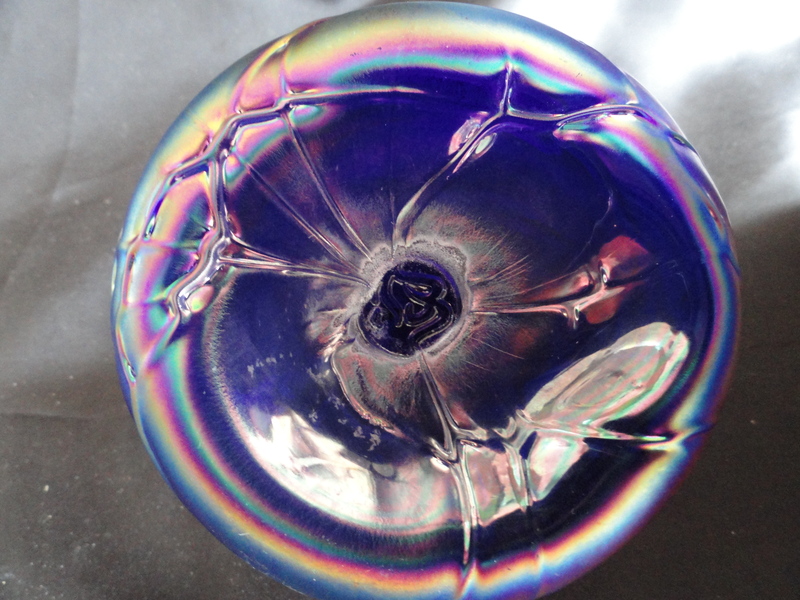 Although Gary’s studio was never truly “discovered” as an art glass paperweight collector I consider the glass paperweights to be exceptional although it can and has been said that his business acumen was dismal, but that was not for lack of effort. Gary Levi was born in 1945 and by the age of 10 realized he wanted to be in the merchandising business. Gary’s original family name was Levay which is Hungarian. An ancestor changed the name from Levay to Levi in the late 1800s. In 1964 Gary Levi was employed as a railroad clerk and became interested in antiques. I met Gary Levi on a hot summer day at an estate auction in the Quincy, Illinois area. I was in my mid 20’s at the time, an avid but with limited funds, Victorian furniture enthusiast. I was serving in the military and home on leave visiting my parents who were both collectors of fine antiques. As usual for us going to huge farm auctions and estate sales in the Midwest was an all day affair where you could visit with neighbors, old acquaintances and get caught up on all the latest gossip. Lunch was always served and usually homemade. My mother who grew up on a farm in the area, knew all of the families, so when their estates were liquidated she knew just about what the inventory for auction would be and which sales had the nicest pieces. Getting stupendous “finds” on the cheap were common. I remember buying a small signed Tiffany vase for 50 cents. At this particular estate sale, Gary came to the auction near the end of the day when the furniture was being sold. He was a short but stout man in his mid to late thirties, auburn red hair, freckles and although he didn’t have a commanding presence he no doubt was very sure of himself and it showed in how he conducted his business. There was a very large assortment of antique furniture and Gary bought most of it at what I considered to be very high prices. My mother, always the teacher, explained to me that Gary Levi would buy furniture, load it into his large, white, horse trailer and haul it to the west coast to sell to dealers for a profit. It was obvious to me that those few who just wanted this piece or that for their home and from this estate were pretty put out with the price run up by Gary and especially disappointed that they didn’t get that piece they had their heart set on. This kind of business by Gary would in my opinion later damage his business reputation. Even today I find that many who knew Gary or of Gary are critical of his business transactions and how he managed his business. He was aggressive and most likely had a Type A personality. Little did I know at that time that Gary’s true love was art glass. Or even that he would later become a glass artisan or that he was a successful glass distributor. In my research I had found information that he had opened his first store in 1966. I am not sure if that was an antique store or a glass store but it is noted that he started selling fine quality giftware, limited editions through a mail order business. His idea was to provide a quality product to glass dealers at reasonable prices. 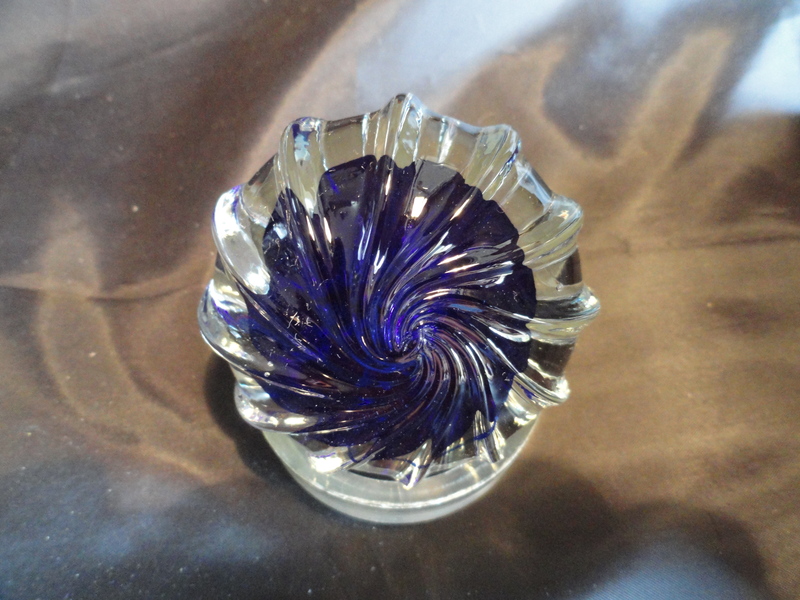 Gary was in contact with different glass companies and would request that a certain amount of an item be made (limited editions), then he would wholesale that glass to dealers. The deal became more profitable when the glass companies agreed to prepackage the limited editions and ship directly to the dealer (drop shipping). Gary was a distributor for many of the major glass companies. So you can see that really he had a good thing going at a period when mail order was big business and drop shipping as well as personal branding was virtually unheard of. His operation was based in the midwest around Edwardsville Il. I have found quite a number of advertisements in the newspapers for his Gift glass in the small towns surrounding Edwardsville. 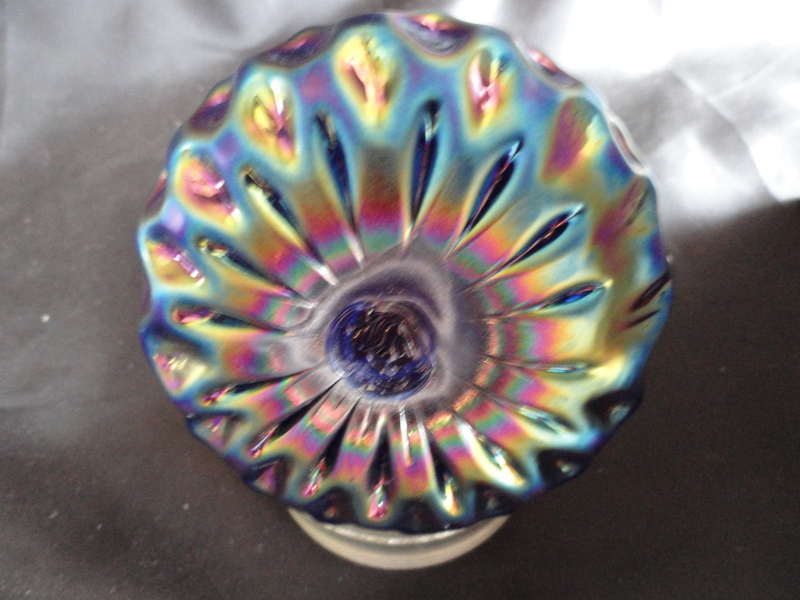 Gary Levi had a long connection with the Fenton Art Glass company that began in the 1970’s. This eventually led to his buying of Fenton cullet when his glass studio needed glass to make their own glass creations. This is not an unusual arrangement. Many glass studio artist purchase cullet from major glass companies to use in their own creations rather than making glass from scratch. 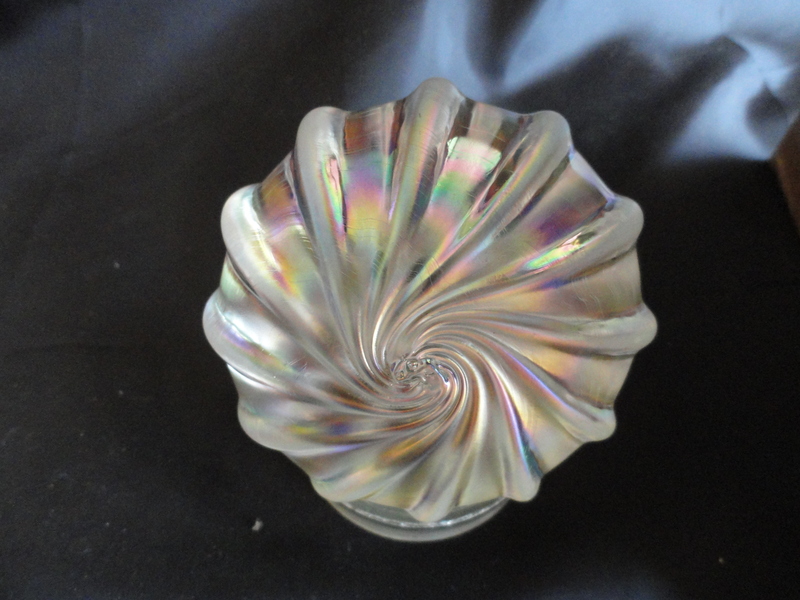 Gary had Fenton make several runs of carnival glass for his company. The unique aspect of this arrangement being that the colors used were not a part of Fenton’s regular line. Fenton, Westmoreland, Imperial, Crescent Glass and L.E. Smith all pressed glass for Gary Levi and his Limited Edition Glass mail order business. 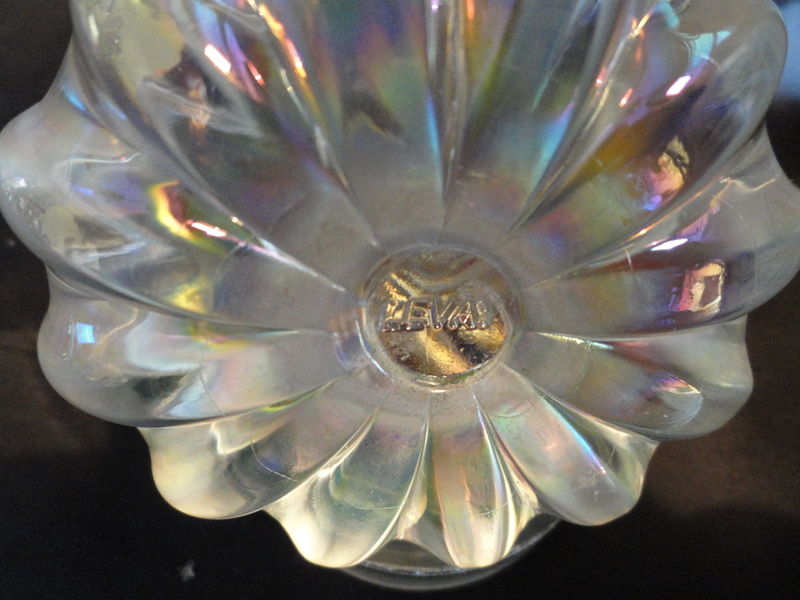 Most of this glass was signed by the glass company but only a few had a Levay logo pressed into it or otherwise marked as Levay Glass (branding). 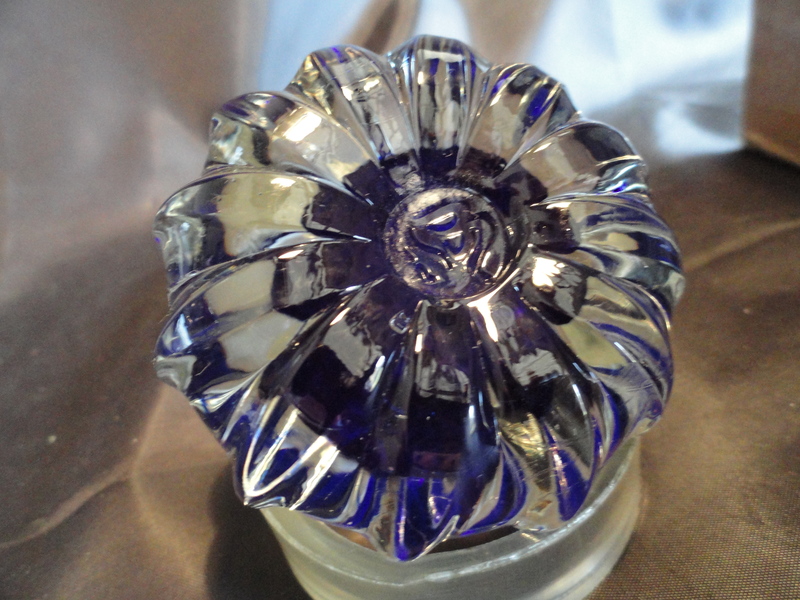 Some of the pieces of carnival glass were made by Westmoreland as well. Most of the art glass pieces were made by Imperial. The newer items 1980 – 1990 were signed and also numbered. 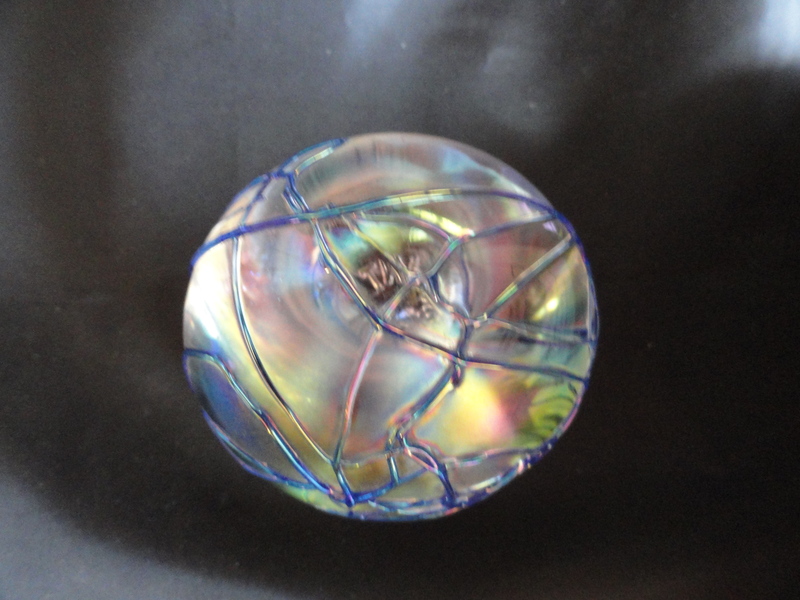 So you will still find art glass pieces not signed but marketed by Levay. 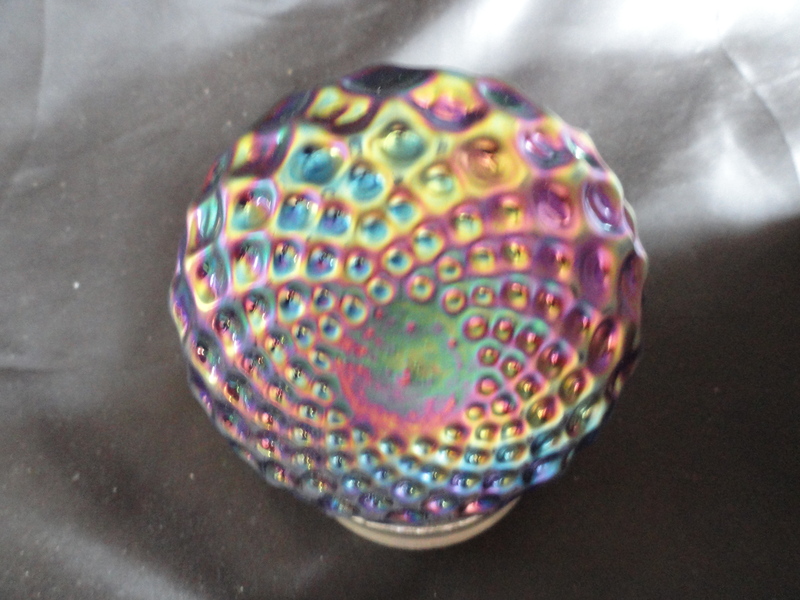 I often see these pieces advertised as experimental pieces made by Levay but they were not made by his glass studio really. This causes some confusion and doubt in my mind on just whether or not Gary Levi ever handled any “hot” glass. 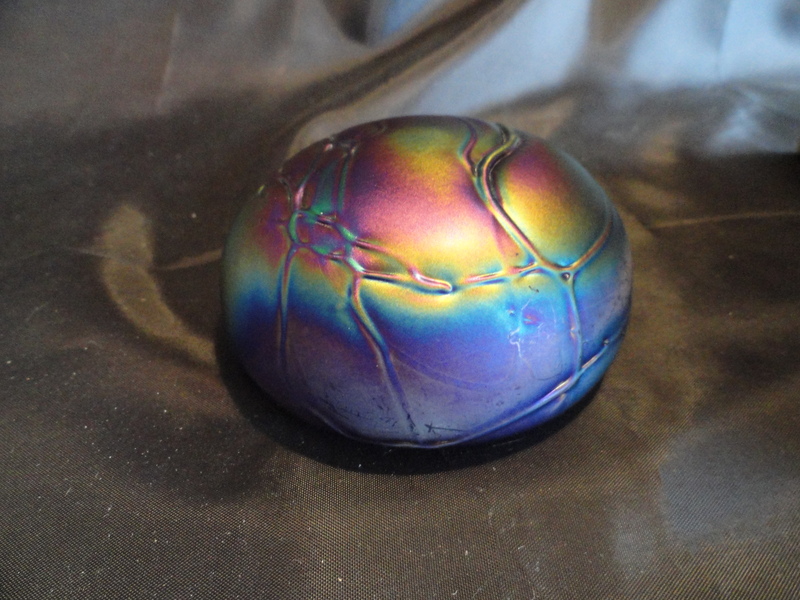 Did he personally handle and make these paperweights I have collected? It is a good question and hard to answer. 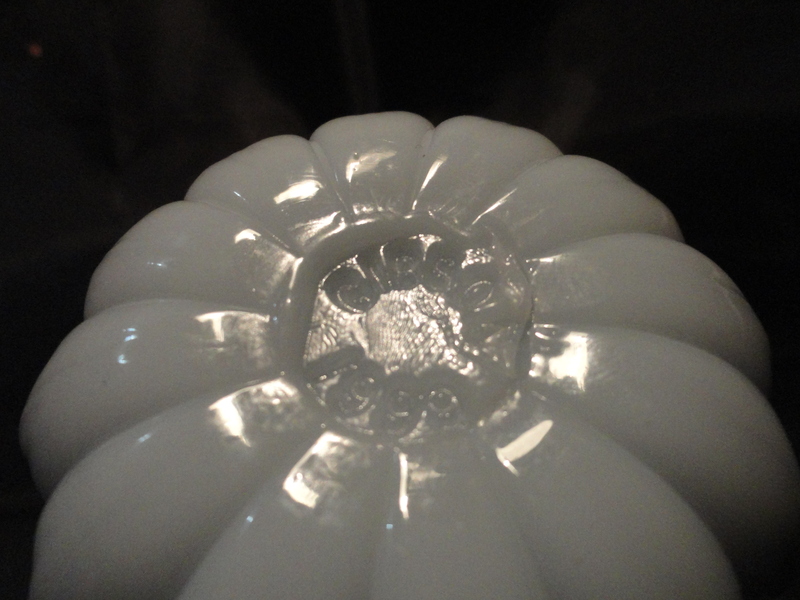 There also seems to be some speculation about whether or not Levay had purchased glass molds from Westmoreland Glass. 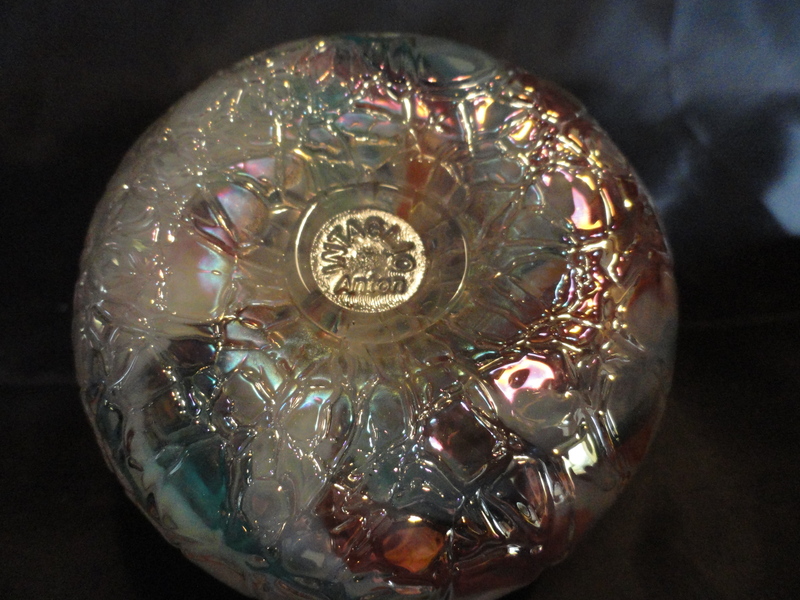 Westmoreland stopped producing glass in 1984 and closed their doors. Are these molds in the old Alton schoolhouse where Gary had his glass operations until the mid 1990’s? 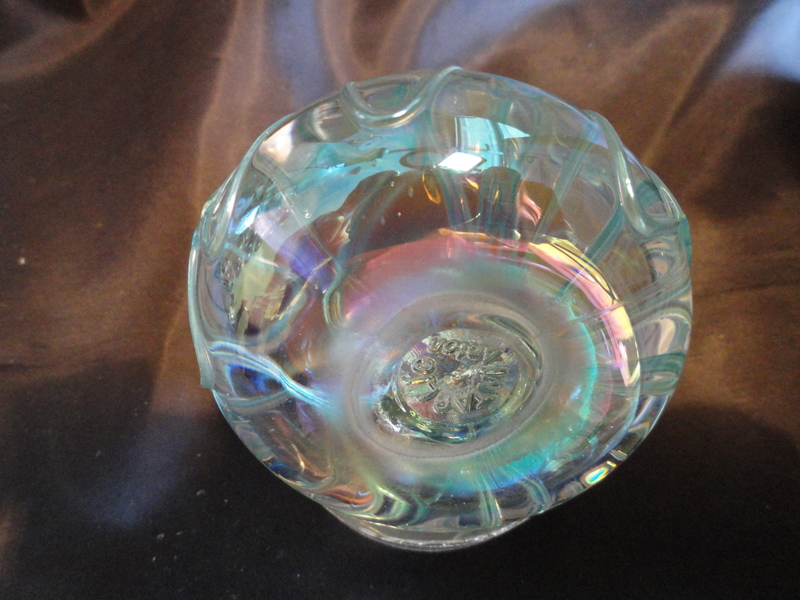 I think it is important to mention that there were probably many who felt that Gary Levi was a usurper of the collectible glass from the well-known glass houses he dealt with. As a collector and talking with many collectors, being taken with a reproduction, fake or fantasy piece is always a concern. An example would be Nippon. Nipponears are very loyal to the items they collect. In the 1970’s there were many knockoffs or fakes imported from China that actually had Nippon clearly stamped on them. This caused much confusion and consternation among Nippon collectors and to this day I get emails from people who ask me. “Is this a real piece of Nippon”? Or a better example is the Galle reproductions made in China that clearly mimic the beautiful lamps and glass works made by Emil Galle in the 1920s. They even have the exact Galle signature carved into them. This has definitely depressed the prices of even original Galle glass. However, with any repro or fantasy piece, if you have ever owned an original and held it in your hands the fantasy pieces become easier to recognize. Now put yourself in the genre of being a Fenton glass collector in the 1980s. You buy a beautiful piece of art glass that has the Fenton logo on it only to find out it also has this ugly frog looking logo on it. What is that anyway? Must be a manufacturing defect! 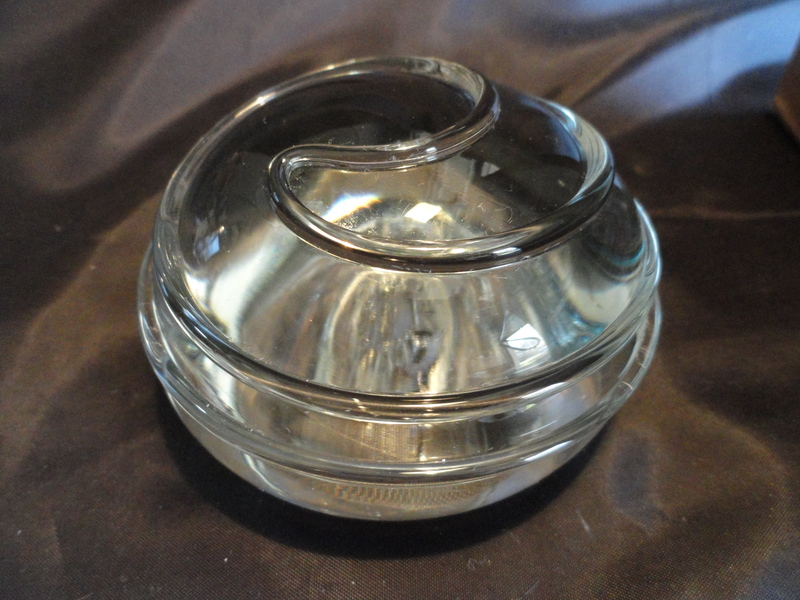 Nope, it was marketed by Levay Distributing also known as the Intaglio Levay Glass Company. If you are a collector of any original period items I know you understand what I am saying. Remember that this is before anybody was doing personal branding that today is an everyday occurrence, think generic drugs etc. All of that is personal branding and huge in the business arena today. Gary was certainly ahead of the power curve and of his time in marketing and manufacturing collectible glass. Was he a marketing guru, a glass maker, both or none of the above? The failure or success of his glass studio tells at least part of the real story. 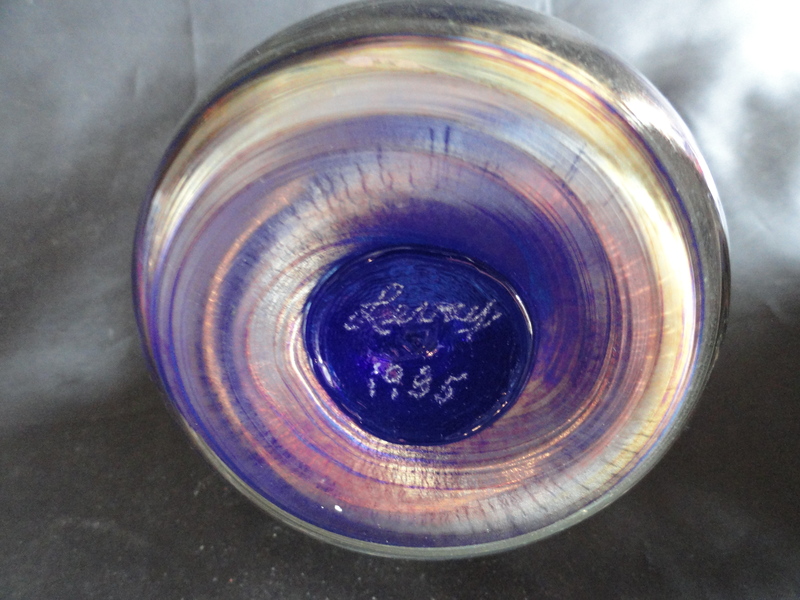 In 1984 Gary Levi stopped having Limited Edition carnival glass made under the name of Levay. I believe his base was in Alton Il. There is a short article in Glass Review, November 1984, p. 32 that notes the Victorian Art Glass Company and states that it is a subsidiary of the Levay Distributing Company and so the confusing and often criticized business saga of Gary Levi’s Intaglio Levay Glass begins. An ad in the February 1985 issue of Glass Review also states that Gary Levi started making his own glass on October 11, 1984. This date coincides with the purchase of some glass making machinery by Gary and I am sure is when he registered his glass studio as a business. At this time I believe he his business location was in Alton on Wood River. It wasn’t until 1990 that he purchased an old schoolhouse in Alton Il to use for his operations. Known locally as the Milton Schoolhouse, the building itself has quite a reputation including even ghost that haunt the property. I came across an article in the Alton newspaper stating that in November 1991 Gary Levi actually purchased the Milton Schoolhouse and was building a new 10000 square foot receiving warehouse for his distributing operation. The schoolhouse was listed as having 50000 square feet. I think you will agree that is a substantial size property for glass making and marketing. The article also noted that Levay had approximately 100 employees and five glass artisans or makers. I wish I could tell you who those five were but at this time I don’t know. One might have been Susan Carr. In other articles I had seen some hiring ads. Gary was looking for employees for assembly and the ad states that they did gluing of glass pieces together. Gary Levi had many registered business names and he wore many hats. The only question is was one of those hats “a hands on glass maker?” It was in 1990 that Gary purchased from a Michael Ladd a business called Intaglio Designs Ltd. The business agreement was quite involved and complicated. The purchase price is public knowledge and registered at $277,983.18. In addition, Michael Ladd became an employee as a Vice President of the new company with a three year contract, a salary and five years of payments from Levay. The contract basically lasted from 1991 to 1997. The purchase involved 490 shares of privately held stock by Levay. Gary also had investors and I have seen a copy of a document where at least one investor put up $100,000.00. That is a lot of zero’s for the 1980s. I am sure there were many others of less denominations. The company never went public it was all private stock. Any person who has owned a business understands the impact investors can have on your business. Although investors are not normally involved with the daily operations of the business they certainly have the power to decide how profits are spent and losses are handled. It is obvious to me that Gary was advancing to the next level in the early 1990’s in his business operation so it must have been quite profitable to be able to fund those kind of numbers. 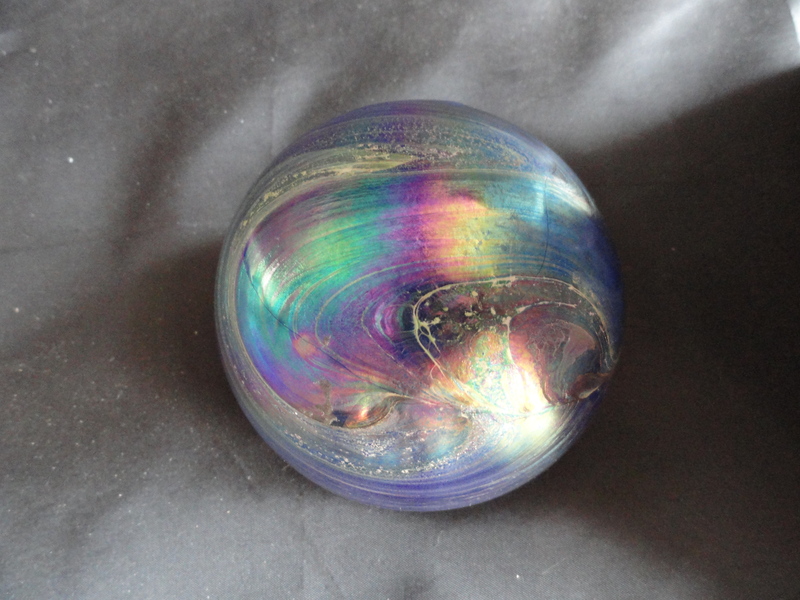 My own personal history of collecting paperweights became intermingled with Gary Levi when I received a beautiful and very unusual art glass paperweight as a birthday gift given to me from my wife. It was my fortieth birthday. 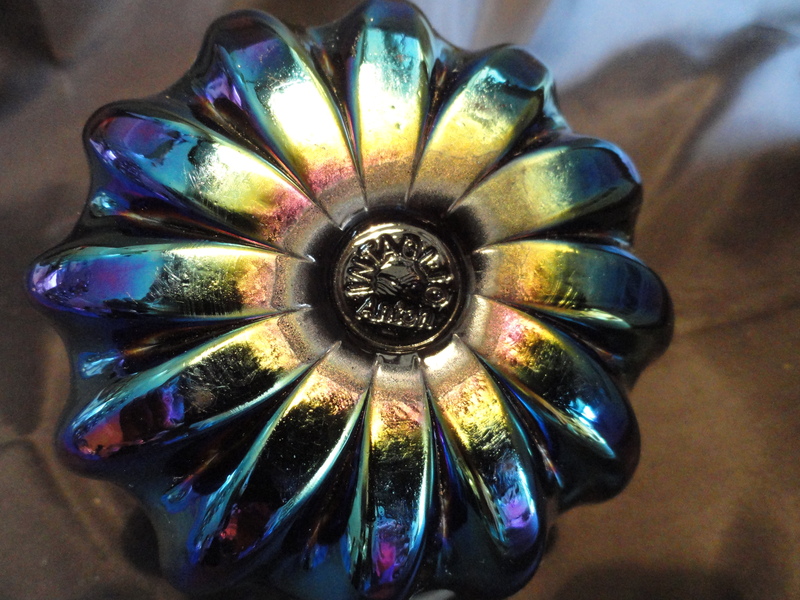 At the time and for many years we did not know who the maker of this beautiful paperweight was although it did have a stylized mark pressed on the base. It wasn’t until much later I learned that it came from the Levay studio and I was hooked. 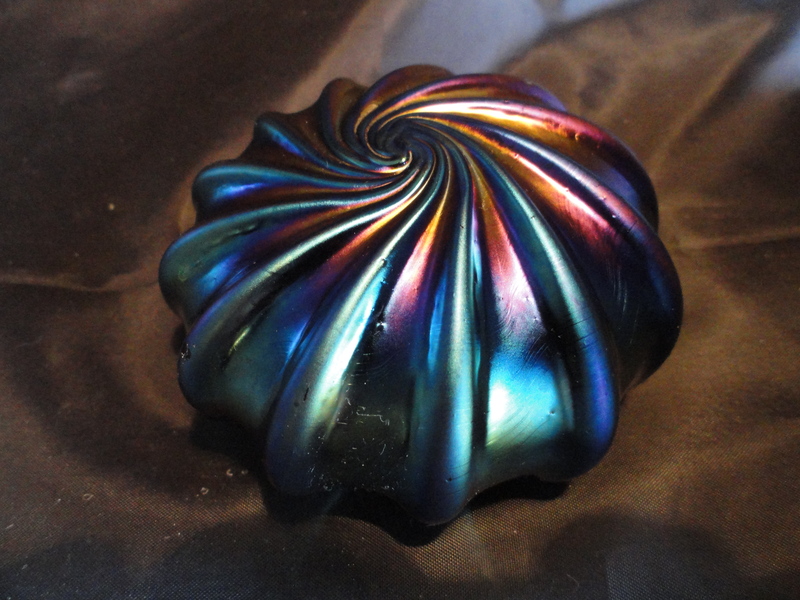 From that time on I have collected these unique paperweights marketed by this studio and have built a respectable collection. It was also at this time that I started researching and collecting information about Gary Levi and Levay. The first of many. 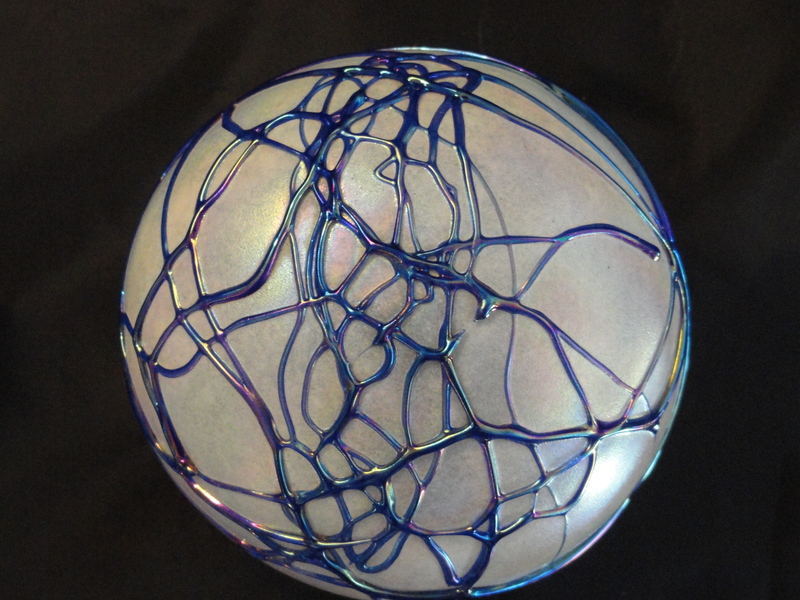 This paperweight is a pearlized white with iridescent cobalt threads across the top. Absolutely my wife’s favorite. Size is 3 1/4 inches and weight is 1 lb. 3.2 oz. 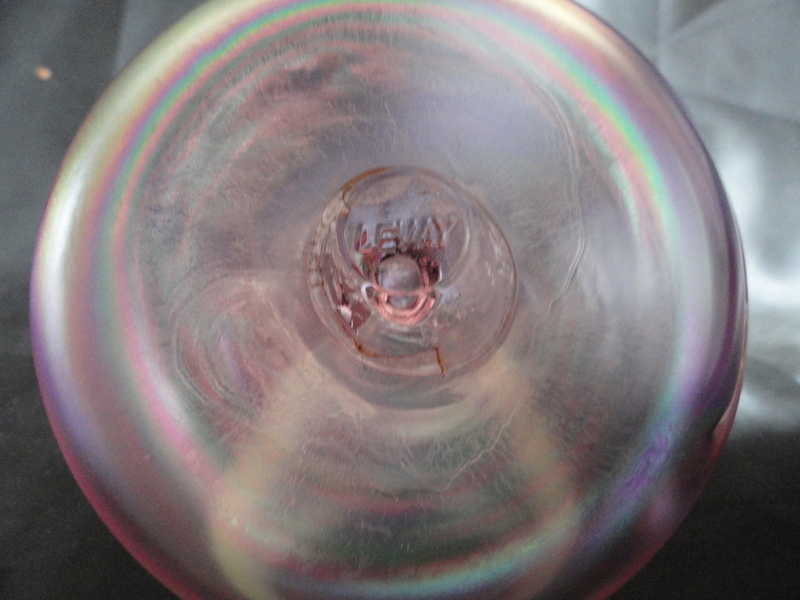 Marked with the Intaglio Levay mark impressed into the glass in the concave base. Purchased in 1992 at June’s Antiques in Quincy IL., across from Baldwin Park on the downtown square. I gave you the exact location because right next door to June’s Antiques was another antique store. Gary Levi’s Antique Furniture Store! It had been there for many years and although I had wandered around inside admiring the antique furniture I am sure I never saw any glass being displayed or sold! 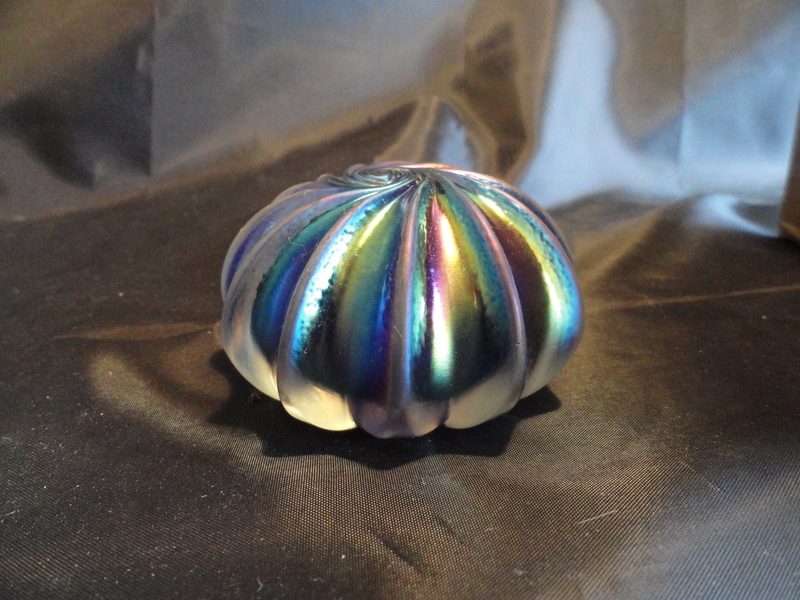 In collecting Intaglio Levay paperweights I have come across many Levay art glass creations. 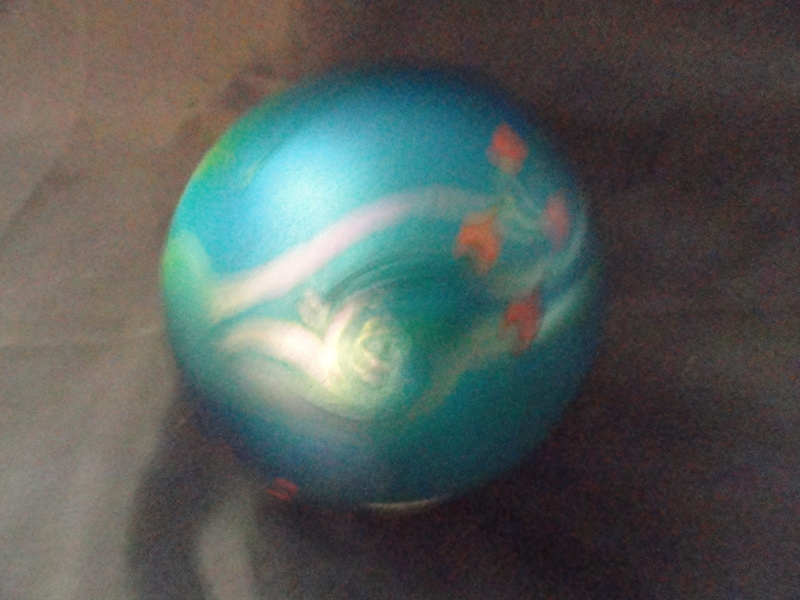 To name a few, bowls, vases, oil lamps, glass orbs or witch balls and garden stones. I have found that often the sellers of these objects have no idea who made it or where it came from. Some confuse the paperweights with the garden stone glass decorations. 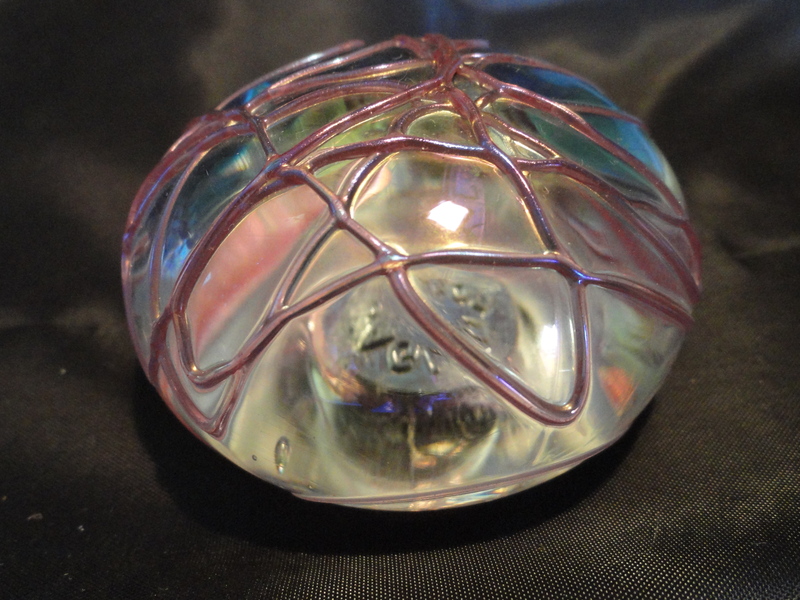 In addition to paperweights marked Levay there are paperweights marked Intaglio Anton which were also marketed by Levay Distributing. 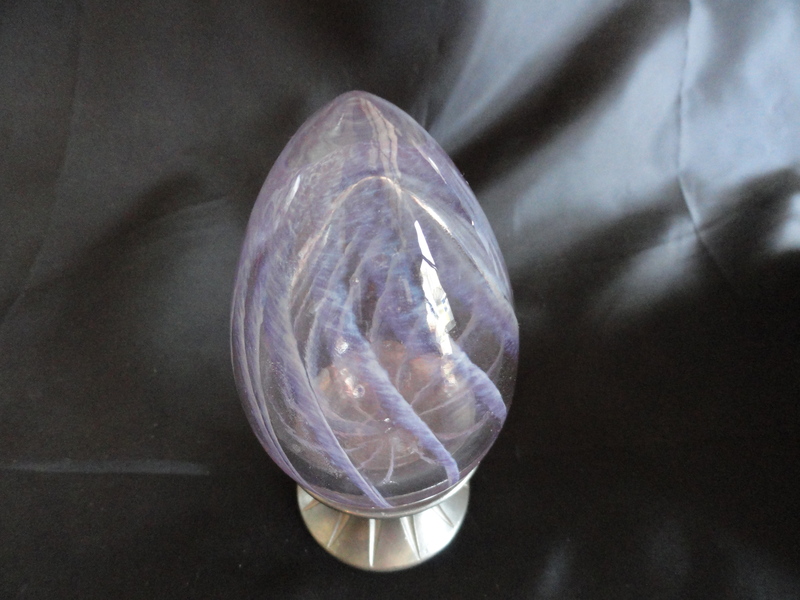 Susan Anton Carr was and is a glass designer and my understanding, was a designer for Gary Levi designing many of the creations that were made. She did a wonderful job! The color, creativity and styles for the period are second to none in my opinion. 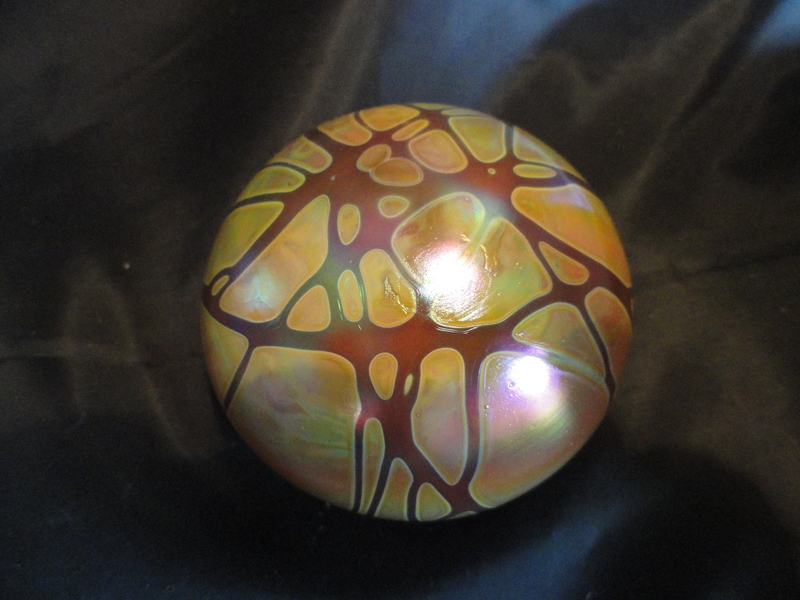 Were these beautiful paperweights made at Gary’s glass studio in Alton Il. specifically for Levay? 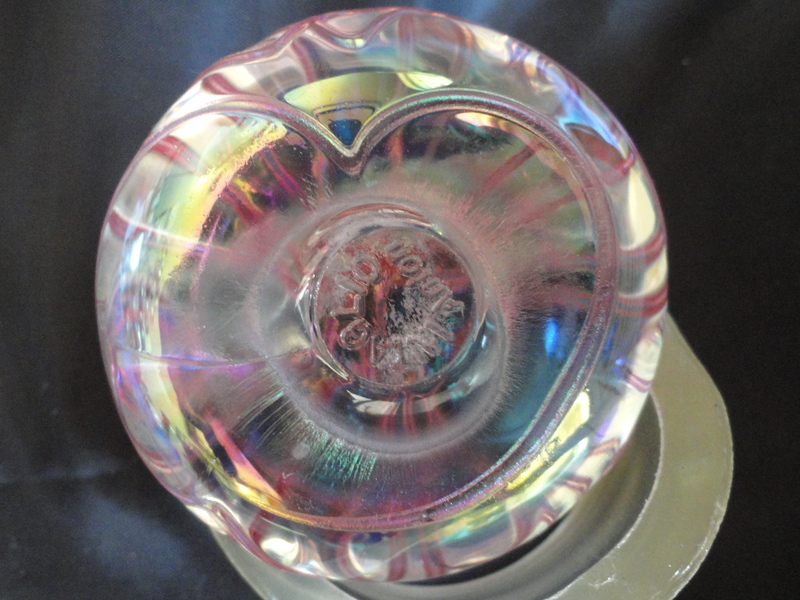 A Levay Hanging Hearts paperweight signed on the bottom LV-132 probably made prior to the Intaglio name being registered. 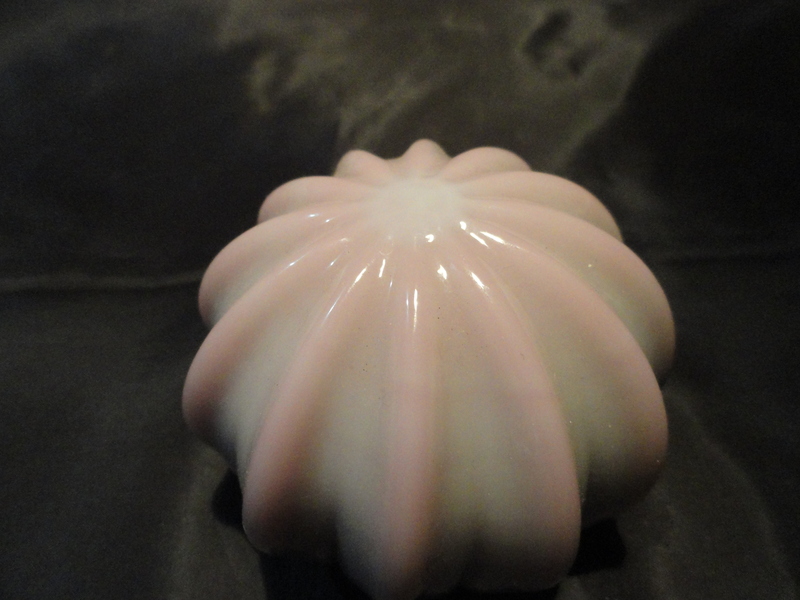 The person I purchased this from did not know the name and when I told them it was made from Fenton cullet they said “Oh, I just love Fenton glass!” Hand signed Levay and dated 1985. 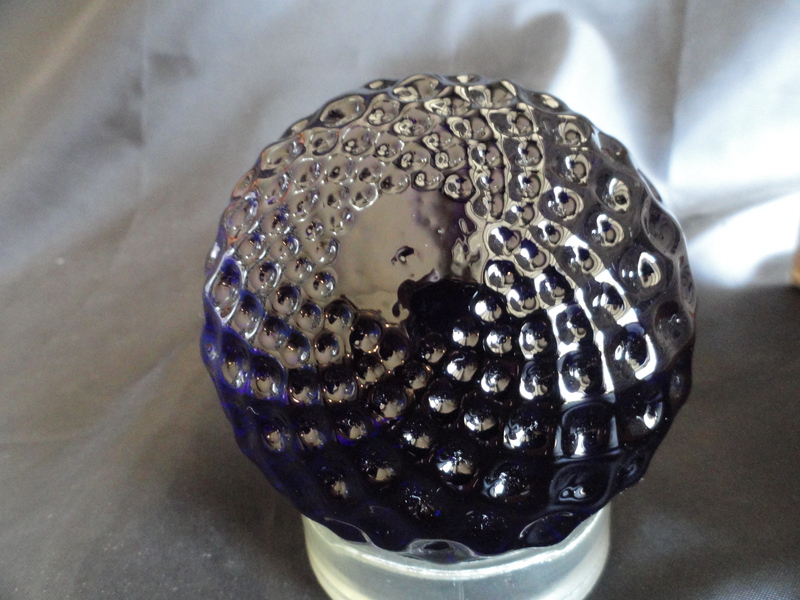 A very nice crackle glass paperweight marked Intaglio Anton. Designed by Susan Anton Carr. Amazing Colors! 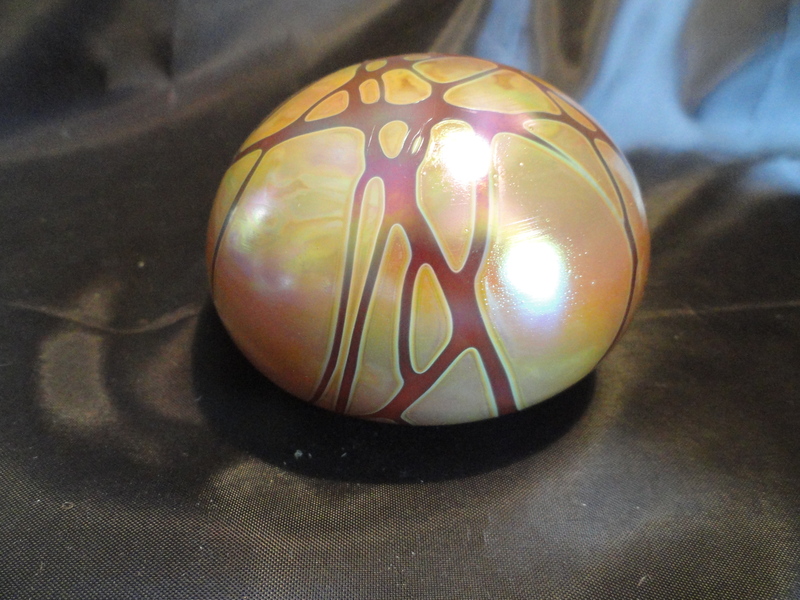 The paperweight has the stylized Intaglio Levay mark on the base. Marked with an imprinted LEVAY no other marks. 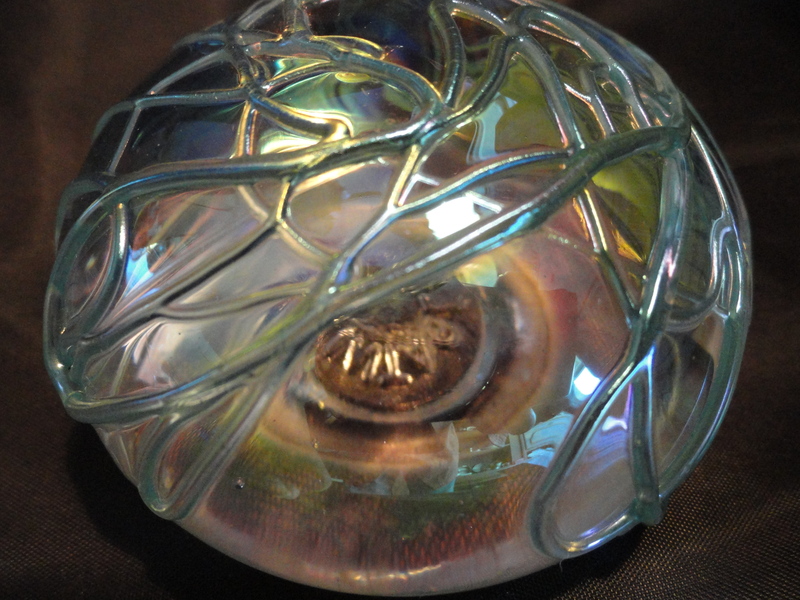 Was this paperweight made by one of Gary’s five glass artisans at Alton? 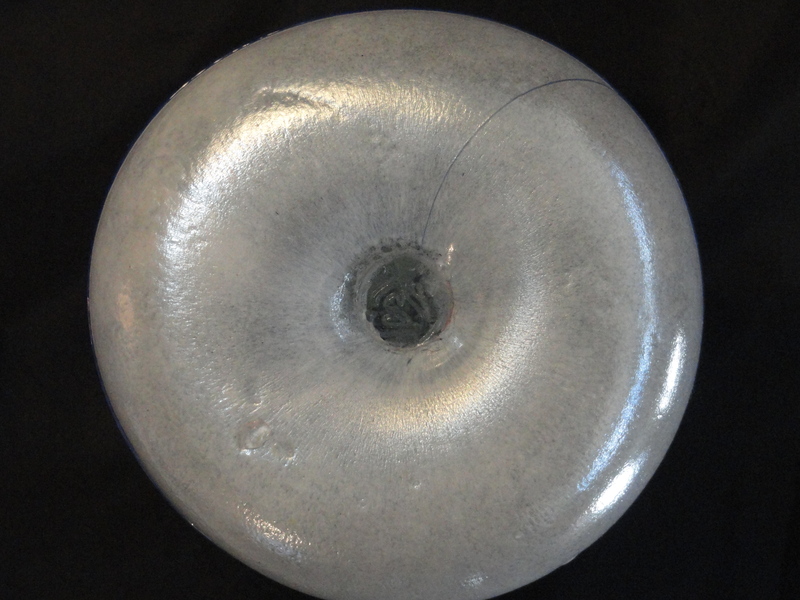 Here is another Intaglio Anton weight. 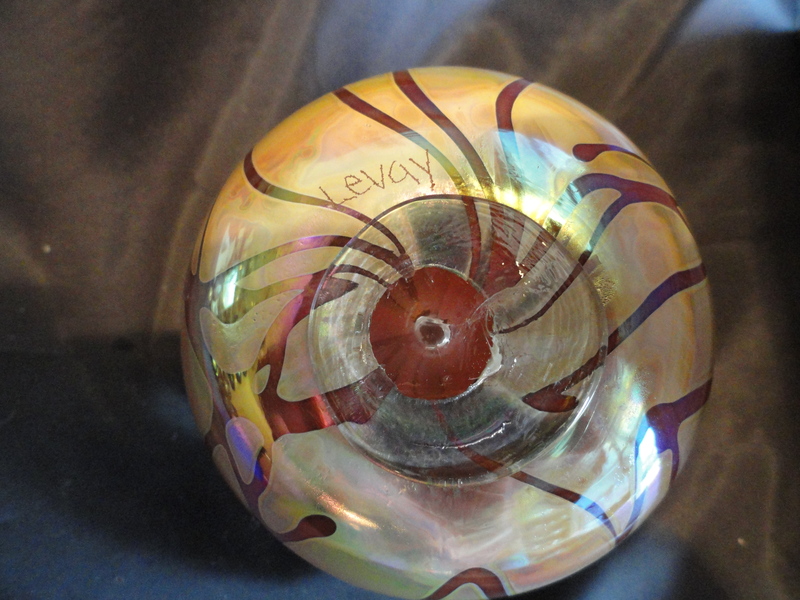 A hollow paperweight with the Intaglio Levay stylelized logo. Marked with the stylelized logo. 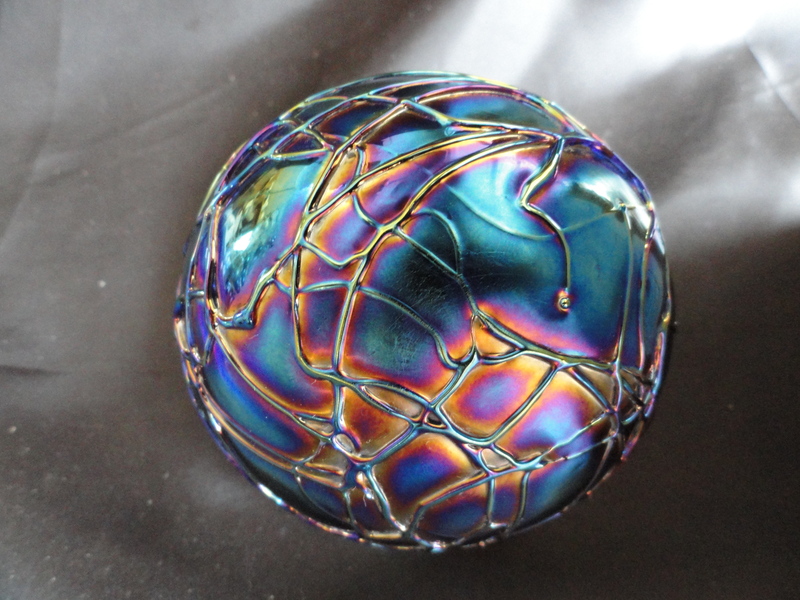 I love the shapes and styles of these paperweights. Excellent MINT condition. 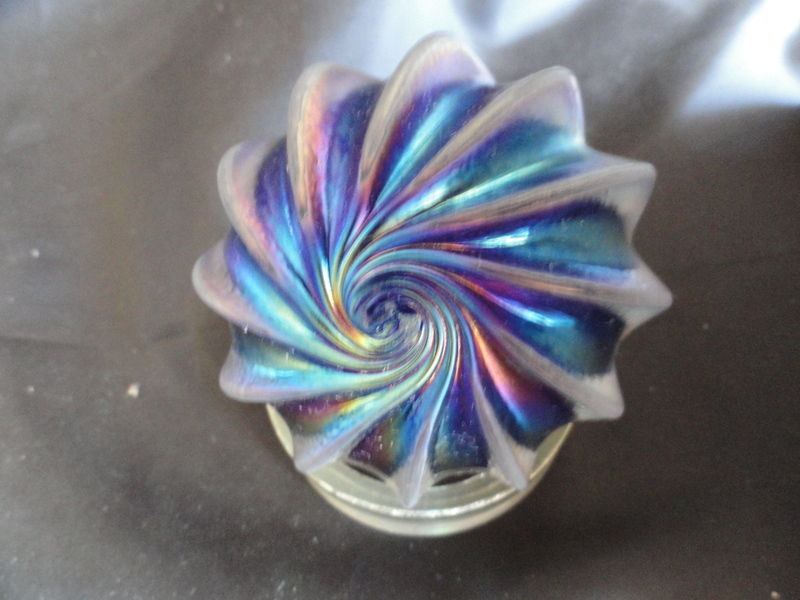 Have you ever seen more beautiful paperweights? Hot stamped LEVAY, no other markings. Same size and shape as the weight above but with a different marking. This one is Intaglio Anton. One has pink threads and the other blue threads. The threads are iridescent. Both weights are marked Intaglio Anton. 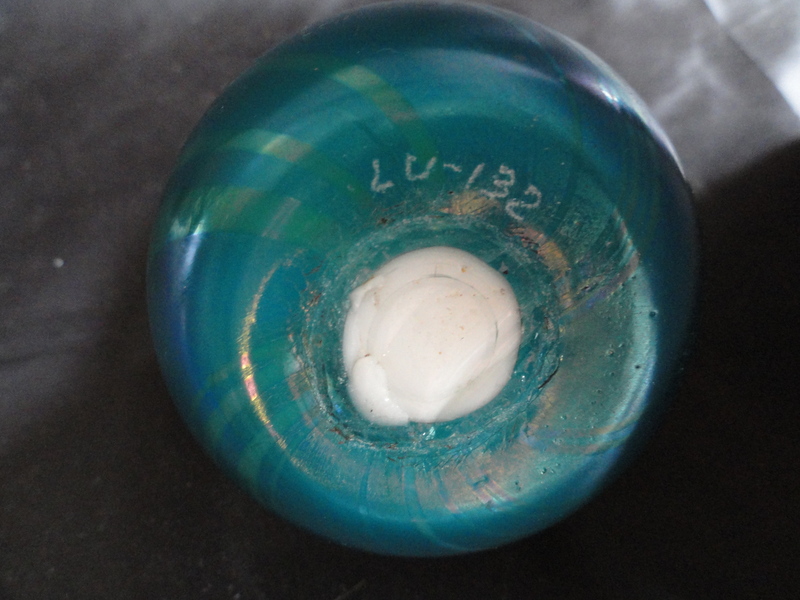 A wonderful blue crackle glass weight marked Intaglio Anton. Hand printed mark Levay, no date. Was this made after Gary locked the doors to his Alton property and walked away? 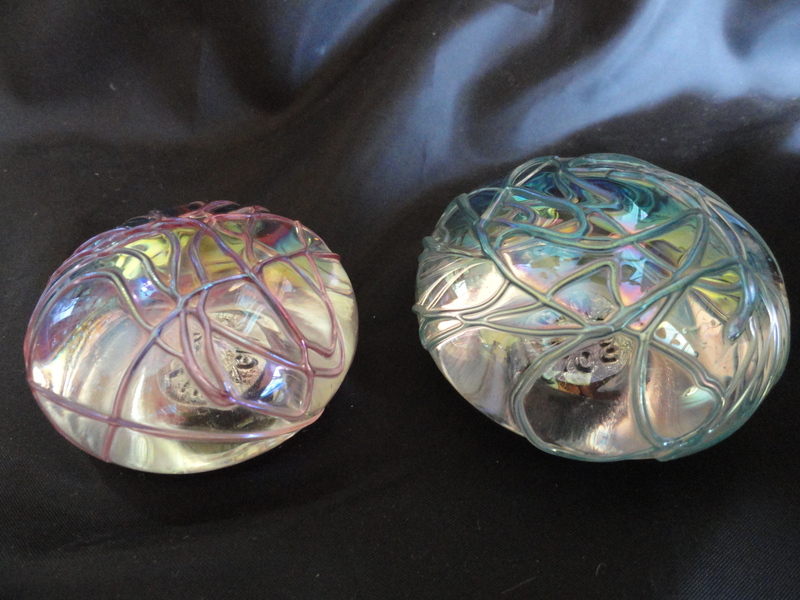 Each of these three paperweights have the stylized Levay mark on the base however I purchased them directly from Fenton. 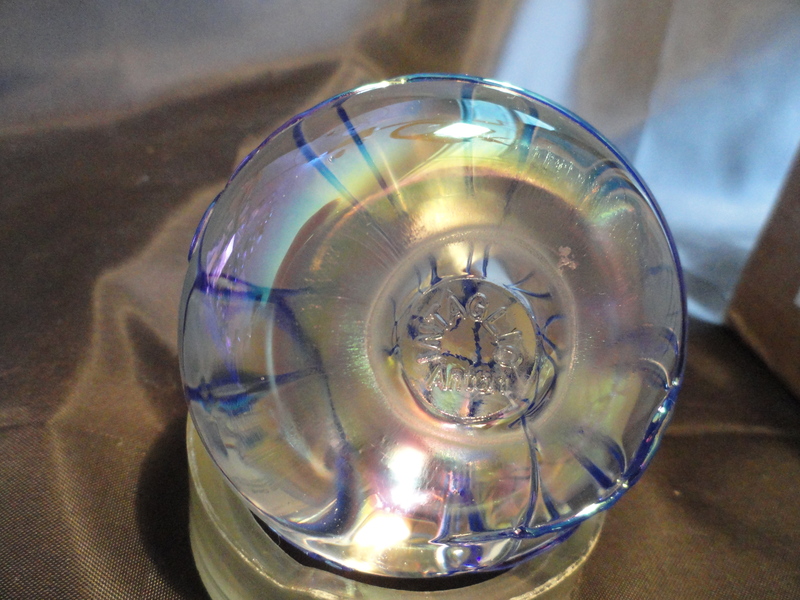 Did Fenton make these paperweights for Gary or were they just being a distributor for him? If they were selling for him then these were most likely made at the Alton Glass studio. 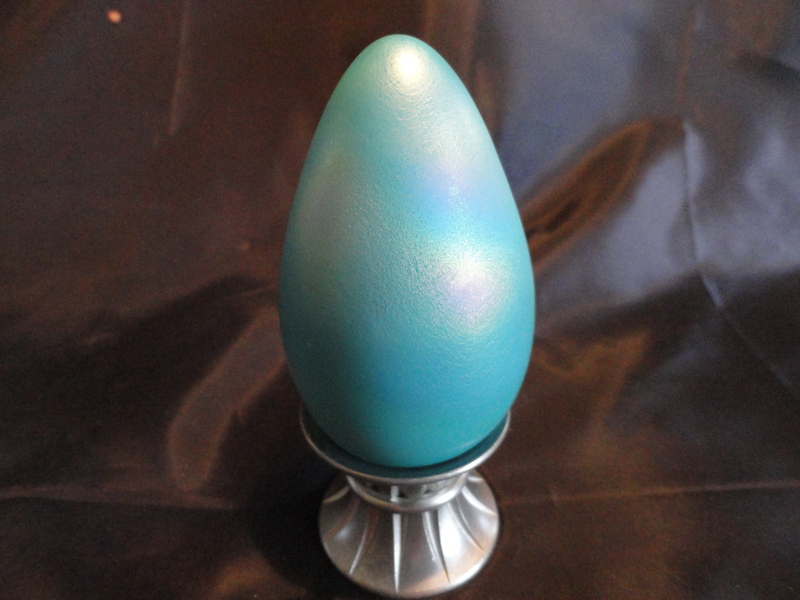 I don’t really collect the egg shaped weights but these two landed in my inventory. One is Intaglio Anton and the other is hand signed Levi 95. This is a part of the collection I have that I term as “Cypriote glass. I can tell you that in my collection it is the most colorful section when displayed and draws many comments and conversations. 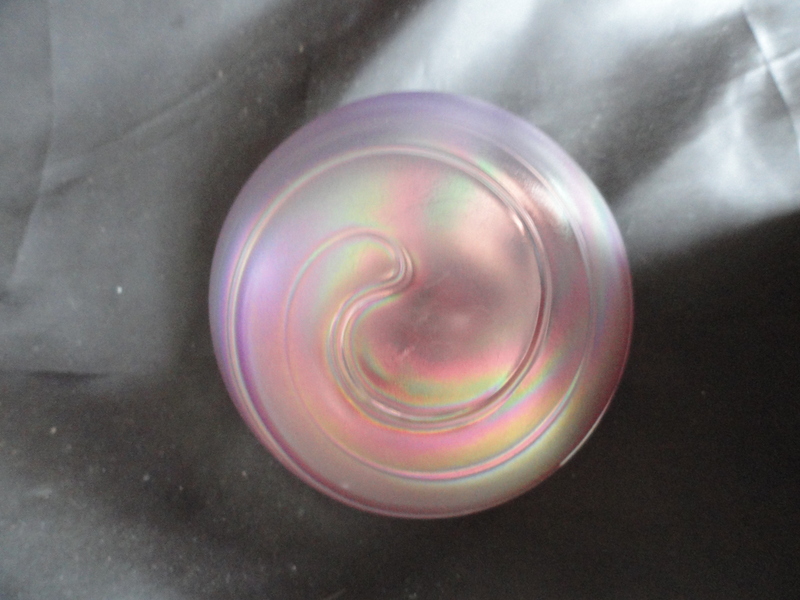 A few years ago I purchased a very nice paperweight made by Gibson and hallmarked as such. It wasn’t until I started researching Levay that I came across a sales ad that showed that particular style and color weight. Was Levay marketing for Gibson or did Intaglio Glass Ltd. purchase from Gibson a Levay branded product? This is a Gibson PW most likely made from Fenton cullet as Gibson was known to purchase cullet from Fenton. 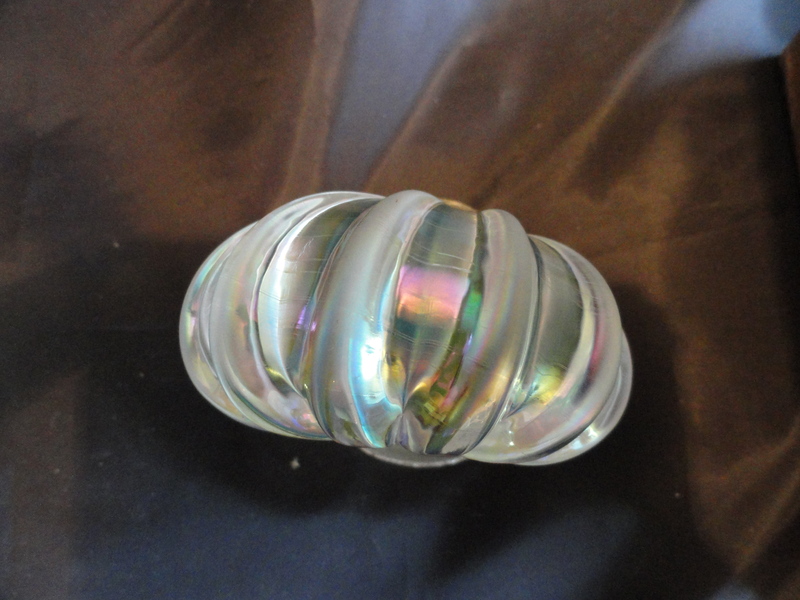 What I find interesting about this particular weight is that Levay marketed and sold this paperweight in the 1990’s. I still have much more info on Levay and Gary Levi so I hope you will return to read the additional writing I will do on this article each week. I also have many more photos of Levay weights I have collected. Why did Levay Distributing close their doors all of a sudden in the mid 1990’S? Gary Levi locked the doors one day and never returned! 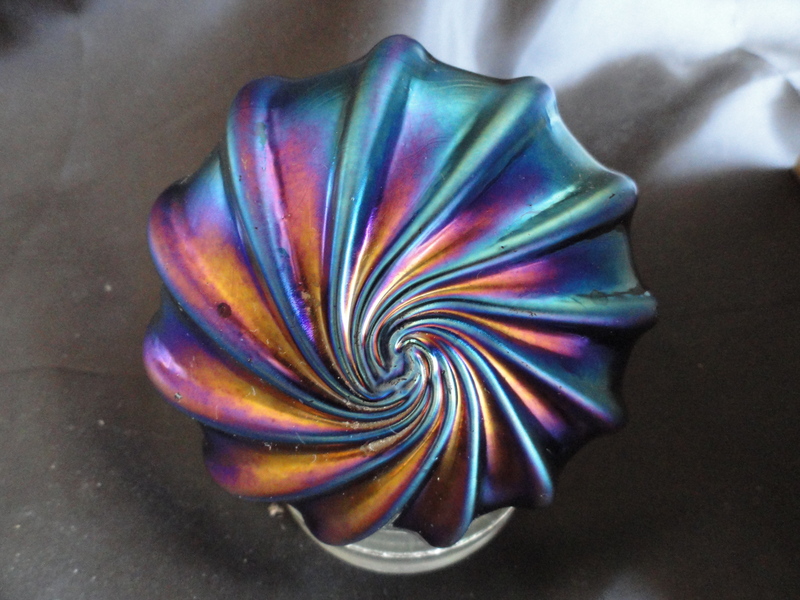 Did Gary Levi design these paperweights? Was Gary a gaffer? 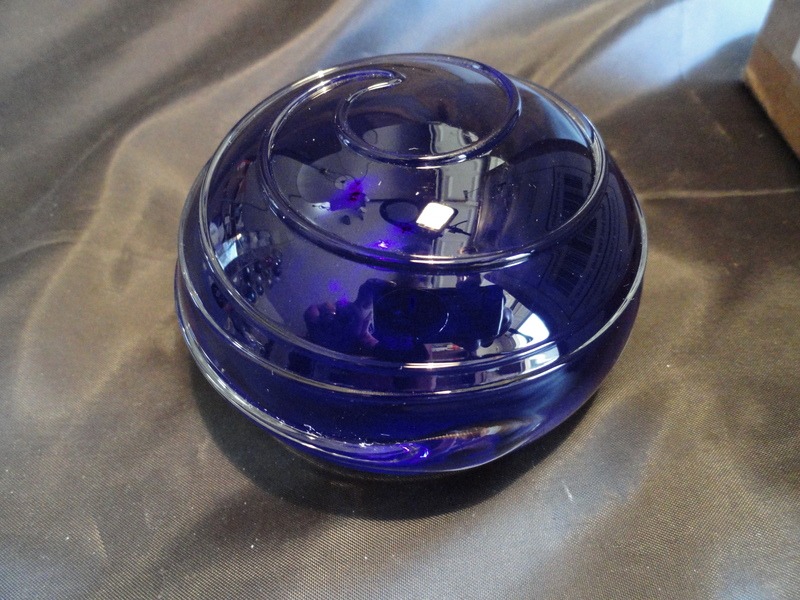 Did he personally make glass paperweights or pay others to do the work for him? Did Inatglio Levay declare bankruptcy? Why did Gary let the distribution center (Milton Schoolhouse) stand locked and shuttered for more than 10 years full of antique/modern glass, paperweights and his antique furniture collection? What is the status of the old Milton Schoolhouse today? Why did Gary’s widow refuse to go to the abandoned Levay center (Milton Schoolhouse) after his death? Was the reason for Gary’s glass business failure do to mismanagement, embezzlement and/or prolific employee theft? That’s it for today. Be sure to check out what I am selling at my eBay store Kelekchens. To go there now place your cursor on my assistant (the duck) and click to enter. I will continue to research and work on this piece until I have it to my satisfaction before moving on. So…until next time “Happy Collecting” and remember “the best is yet to come”.